The orange salad, of course!! I don’t know you, but when I was a child it was usual to eat orange salad, seasoned with olive oil and salt. It’s a dish with a peculiar taste: salt because of the salt, sweet and acid because of the orange. At the end we have a sour-sweet salad, which I suggest to eat as side dish with some meat, most of all porc. Today I went further, I added even a bit of… spicy, using some spicy mature cheese. Well, we’ve got a salad plenty of Vitamin C and taste: an orange, red onion, olives et cheese salad! 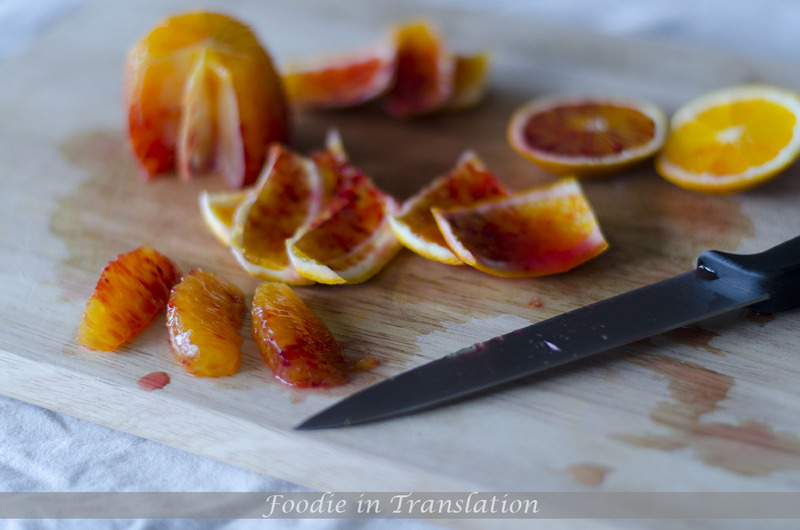 Supreme the oranges : slice off the top and the bottom of the orange, using an utility knife or a paring one. Remove all the rind and pith, following the shape of the fruit. Slice along the inside of the membranes between every wedge and lift out the segments. The procedure seems difficult, instead it is easier done than said. Pit the olives and slice them. Peel the onion and slice it into rings. 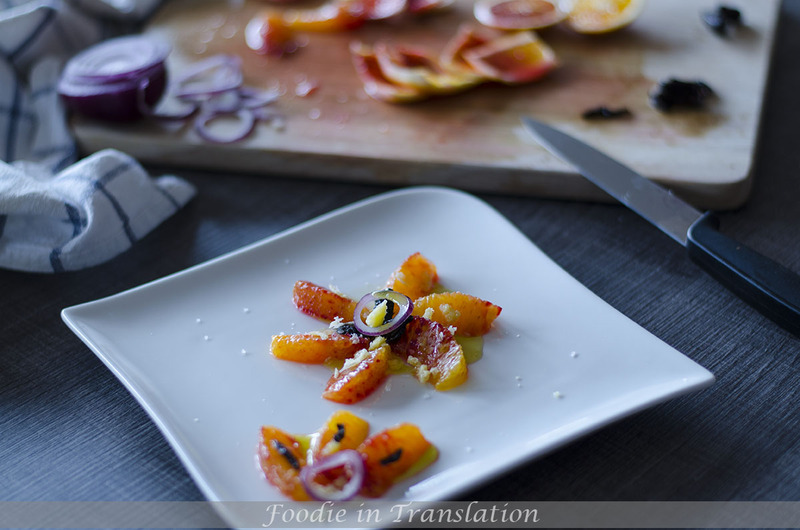 Place the orange’s segments on the plate, add the olives and one or two onion rings. Add some shaved cheese: I used an Italian mature cheese, made with the milk of authentic mountain cows, with a savoury and spicy taste. Do not use Parmigiano Reggiano or Grana Padano because they are not enough tasty for this dish. 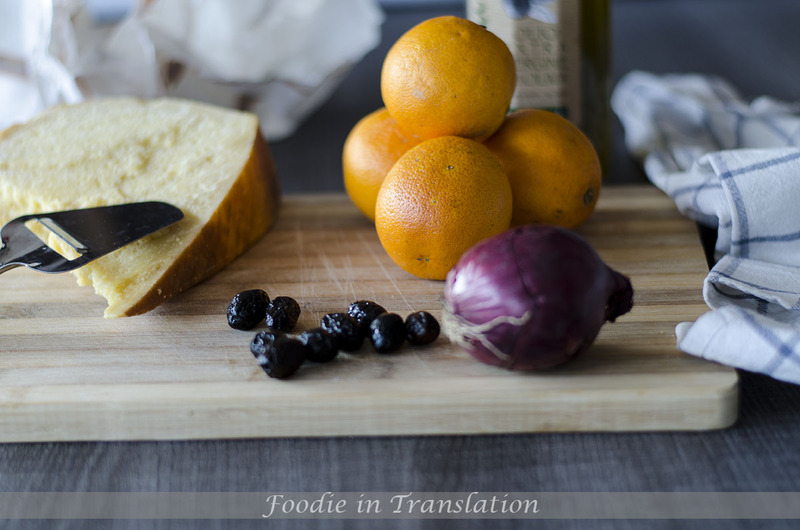 Drizzle with olive oil and our orange, red onion, olives and cheese salad is ready!